Showcasing show stopping sparkle, this 9ct yellow gold ring is a stunning piece of jewellery. Featuring a large cushion cut cubic zirconia at its centre for a breathtaking beauty; this chic ring is finished with elegant detailing as smaller cubic zirconias are set on either side of the central stone as well as along the shoulders for a glamorous look. 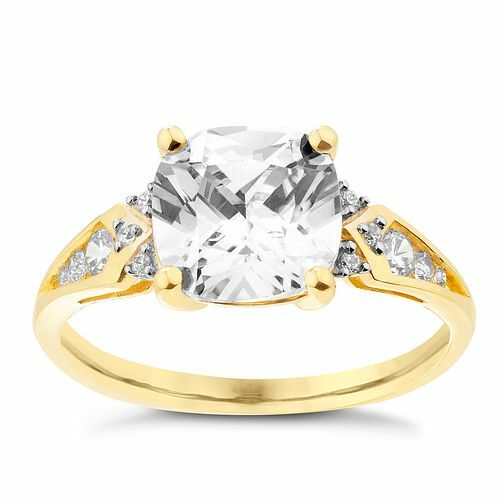 9ct Yellow Gold Cushion Cut Cubic Zirconia Ring is rated 4.5 out of 5 by 4. Rated 5 out of 5 by Anonymous from Gorgeous This ring is stunning in person and is a lovely fit. Pictures don't do it justice. Highly recommended. Rated 4 out of 5 by Anonymous from Beautiful ring Looks much better than photos. Bought it for my wife and she loves it.